His Eminence, Archbishop Nathaniel was born in 1940 to Joseph Popp and Vera [nee Boytor], a family of Romanian heritage who attended the Saint Michael the Archangel Romanian Greek Catholic Church in Aurora, IL. Having gained from his experiences at Saint Michael’s a desire to serve the Lord as a priest, he attended Saint Procopius College, a Benedictine-operated liberal arts school, and the “Pontifical Eastern Rite Center” in Lisle IL. Called to Rome, Italy, by the Romanian Byzantine Rite Catholic Bishop Vasile [Cristea], he studied at Gregorian University and resided at the Greek College of Saint Athanasius. Having completed his studies, he was ordained into the Holy Diaconate on July 17, 1966, at Colle de Tora, “San Anatolia” summer chapel of the “Collegio Greco” by Bishop Vasile. On October 23, 1966, he was ordained into the Holy Priesthood in the Romanian Catholic Church “San Salvatore” in Coppele, Rome, by the same hierarch. In January 1967, he returned to Aurora and appointed assistant priest of his home parish. The spirituality, theology, and mission of the Orthodox Christian faith, which had been dormant in him, began to beckon, and within a matter of months, he decided to embrace Orthodox Christianity. Having left the Aurora parish, he visited with former classmates from Rome who had embraced Orthodox Christianity and were serving in various “jurisdictions” in North America. Through Father Vasile Hategan of New York, NY, and later Cleveland, OH, he was introduced to Archbishop Valerian [Trifa], who worked with him to be received into the ranks of the clergy of the Romanian Orthodox Episcopate of America [ROEA]. He fully embraced the Orthodox Christian Faith in the Chapel of the Nativity of the Birthgiver of God at the Vatra Româneasca, Grass Lake MI, in the presence of Archbishop Valerian on February 15, 1968. For several years, he resided in a small monastic community on the Vatra property until he was appointed rector of Holy Cross Church, Hermitage PA.
An author of numerous articles, speaker, and lecturer, he also taught at the Episcopate’s summer youth camps. He was confessor to the sisterhood of Holy Transfiguration Monastery, Ellwood City, PA, and was instrumental in the founding of an inter-Orthodox women’s association in the Hermitage area. In April 1978, he was one of two representatives of the Orthodox Church in America [OCA] at the conference on monasticism in Cairo, Egypt. He also had served as spiritual advisor to the American Romanian Orthodox Youth and an active member of the Episcopate’s liturgical commission, late vocations program, and Episcopate Council. In addition to these duties, he pursued the painting of icons on glass (”icoane pe sticla”) in the Romanian peasant style and collected historical art and artifacts. At the request of Archbishop Valerian for administrative assistance, he was called to the episcopacy at a special Congress of the Romanian Orthodox Episcopate on September 20, 1980. On the feast of the Feast of the Transylvanian martyrs Sofronie, Visarion, and Oprea, October 21, 1980, he took the Lesser Schema at the Vatra Chapel, taking the name of the Holy Apostle Nathaniel, and elevated to the rank of archimandrite. His consecration to the episcopacy took place at Saint George Cathedral, Southfield/Detroit MI, on November 15, 1980. 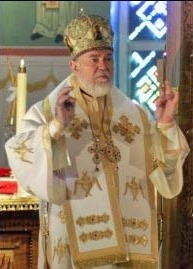 He was consecrated by Metropolitan Theodosius of Washington, Metropolitan of All America and Canada, Archbishop Valerian of Detroit and the Romanian Orthodox Episcopate of America; Bishop Kyrill of Pittsburgh [OCA-Bulgarian]; Bishop Dmitri of Dallas [OCA]; Bishop Christopher of the Eastern Serbian Diocese [Serbian Patriarchate]; Bishop Boris of Chicago [OCA]; and Bishop Mark of Boston [OCA]. He was installed the following day as Bishop of Dearborn Heights, with Saints Peter and Paul Church as his cathedral, and named an auxiliary Bishop for the Episcopate. Bishop Nathaniel assisted Archbishop Valerian in this capacity until 1984. On Sunday, November 17, 1984, after the retirement of Archbishop Valerian, Bishop Nathaniel was enthroned at Saint George Cathedral as ruling Hierarch of the Romanian Orthodox Episcopate of America. Since then, he has overseen the tremendous growth and expansion of the diocese with the establishment of dozens of new missions and parishes and monastic communities for women and men, while carefully maintaining the Romanian tradition and integrating many recent immigrants into North American society. At the same time, he recognized the importance of a united Orthodox Christian witness in this land, and has remained at the forefront of the movement toward this end. Archbishop Nathaniel is chairman of the V. D. Trifa Romanian American Heritage Center in Grass Lake MI; and organizer of the “Help for Romania Fund.” In 1990, he co-founded the “Help the Children of Romania” project and, since 1991, he served as chairman of the Congress of Romanian Americans [CORA]. He has also served as President of the Board of the Center for Orthodox Christian Studies in Detroit and Spiritual Advisor for Orthodox Christian Laity [OCL]. He has served the Orthodox Church in numerous capacities including: Episcopal Moderator for the Pastoral Life Ministries Unit, and as Chairman of the Canonization as well as the Canons and Statute Commissions, and the Statute Revision Task Force. In 1994, Archbishop Nathaniel fulfilled a desire to make a pilgrimage to Romania. In 1995, at the invitation of Patriarch Teoctist, he was a guest of the Patriarchate at festivities marking the 110th anniversary of the granting of autocephaly to the Church of Romania and the 70th anniversary of the establishment of the Romanian Patriarchate. In May 2003, he traveled to Romania again, where he was awarded an honorary doctorate degree from the University of Oradea in recognition of his leadership of the Romanian Orthodox community in North America and of his humanitarian efforts in post-communist Romania. Under his direction, members of the ROEA came to the aid of their brothers and sisters in Romania immediately after the fall of communism, and continue to this day to petition for their rights. Concurrently, the ROEA resumed a relationship with the Church of Romania, with Archbishop Nathaniel working for a greater understanding between the Patriarchate and the Episcopate. Archbishop Nathaniel has been an active member of the Holy Synod of Bishops of the Orthodox Church in America since his consecration, and he has represented the OCA at numerous events in North America and Europe. On Wednesday, October 20, 1999, in its fall session, the Holy Synod elevated him to the dignity of Archbishop.